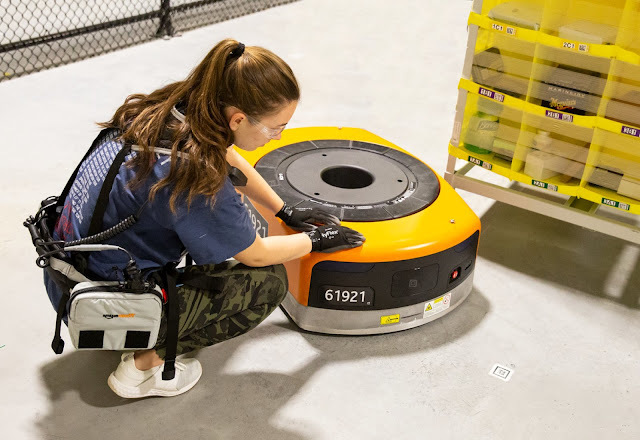 Amazon is using an electric vest to help improve worker safety when dealing with automated systems and robots inside its warehouses, according to a report from TechCrunch. The Robotic Tech Vest, which is really just a pair of suspenders connected to a belt, signals to robots that a human is entering a space to avoid any sort of collision. The way the so-called vest works is by arming human workers with sensors that can communicate with robotic systems. On occasion, a human worker will need to enter an area primarily dominated by automated machines in order to perform maintenance or to pick up items that have fallen to the floor. With the vest on, robots can detect the human presence and adjust their behaviors. The bots will slow down and steer away from humans, allowing work to continue rather than shutting down the operation entirely for a quick fix. Amazon's sensor-filled belt solution comes just one month after a robot-involved accident in one of the company's warehouses resulted in the hospitalization of 24 workers. Reports at the time indicated that one of Amazon's robots managed to puncture a can of bear repellant and release the spray inside the warehouse. More than 50 workers in total were affected by the incident.